There was a grand little party on Grand Monday night. 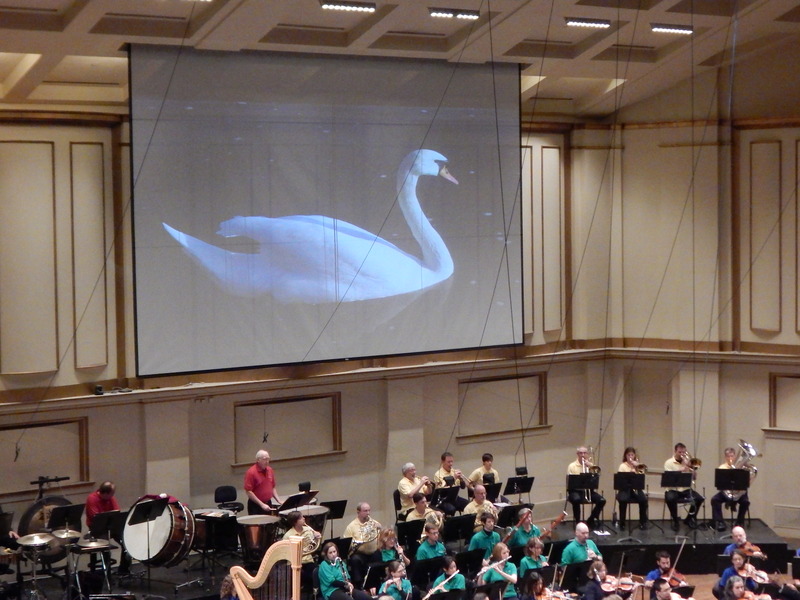 The Four Seasons of Fashion featured music–Vivaldi’s The Four Seasons performed with a stunning St. Louis Symphony string ensemble led by Concertmaster David Halen–and classic couture selected by Cameron Silver and worn by long-legged models. 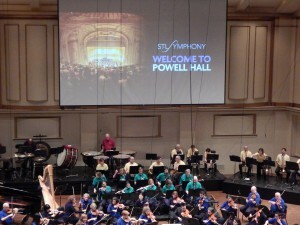 Proceeds for the Powell Hall soiree, which included cocktails and fancy bites, go to the orchestra and its Education and Community programs. Miran Halen got the fashion ball rolling last fall and was instrumental in keeping it on course toward the success of Monday night. Everybody was smiling throughout the pre- and post-party and throughout the show, which is always a good sign. 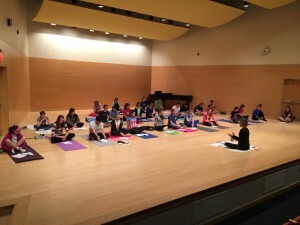 Heidi Harris teaches master class. Style, grace, discipline–developing the beauty of being that resonates through the music you make or the clothing you wear or the joy you find among others. 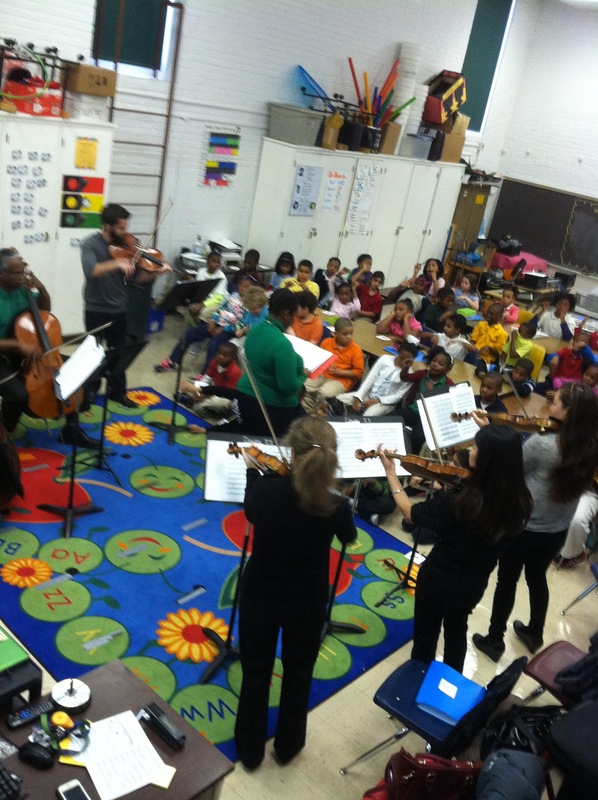 St. Louis Symphony Director of Education Berakiah Boone brought six Symphony string players to perform Vivaldi’s Winter from The Four Seasons for second graders at Dewey Elementary on Tuesday. Violinists Ann Fink, Xiaoxiao Qiang and Eva Kozma, violist Chris Tantillo, cellist Alvin McCall and bassist Dave DeRiso played for an exuberant audience. 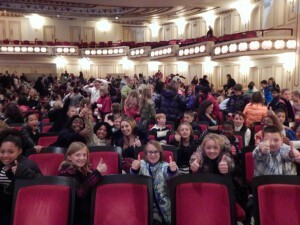 Do second graders get Vivaldi? 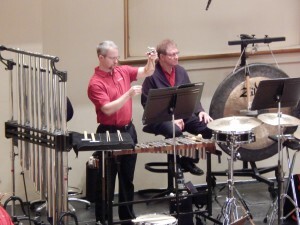 They bobbed their heads to the beat, they danced in their seats to the rhythms, they recognized shifts in tempo and knew what “tempo” means. I barely got “Row, Row, Row Your Boat” when as was in second grade. Berakiah Boone (center) with members of the St. Louis Symphony strings at Dewey Elementary. 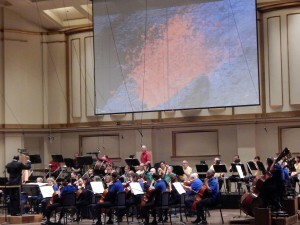 A reminder that if you want to see and hear more stuff about David Robertson’s 10th season, 50 Symphony musicians playing solos throughout 1415, and all things wonderful relating to the St. Louis Symphony’s 135th, visit this link to 10-50-135 for videos, as well as my podcasts about each program. These podcasts are especially erudite, intelligent, informative and are a fun way to hear the English language mangled. I’m also usually running behind. We’ll get 4 Seasons up asap. 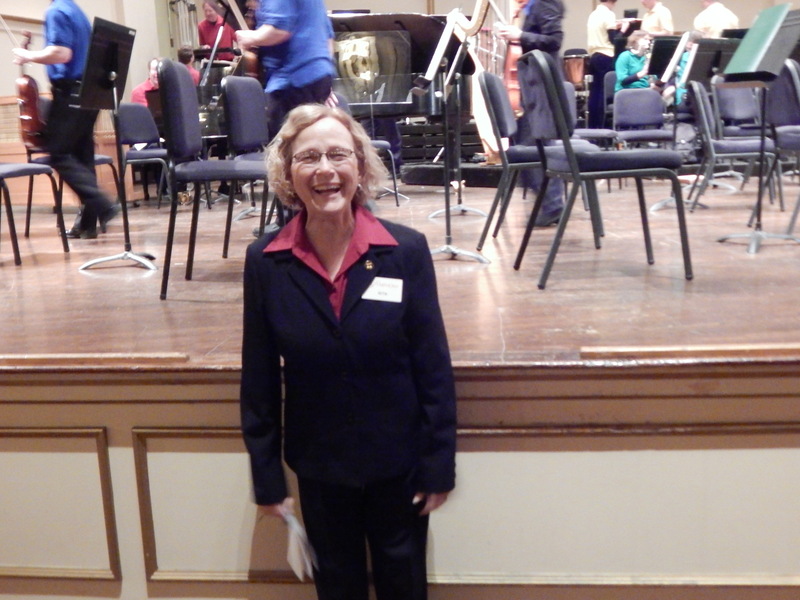 Angie Smart warmed up for this week’s performance of Vivaldi’s “Summer,” from “The Four Seasons,” during recent Education Concerts. With St. Louis experiencing the forces of early winter this week, the Symphony welcomed a few thousand schoolchildren to learn how composers have used nature as inspiration: storms, rivers, the power of a sunrise, the power of the Earth itself, and the grandeur of outer space. 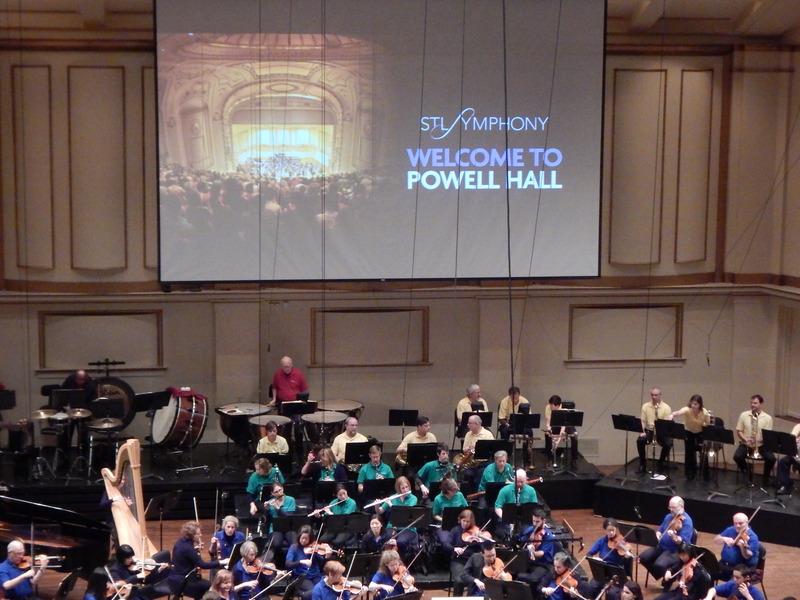 The students received a welcome via the big screen at Powell Hall. 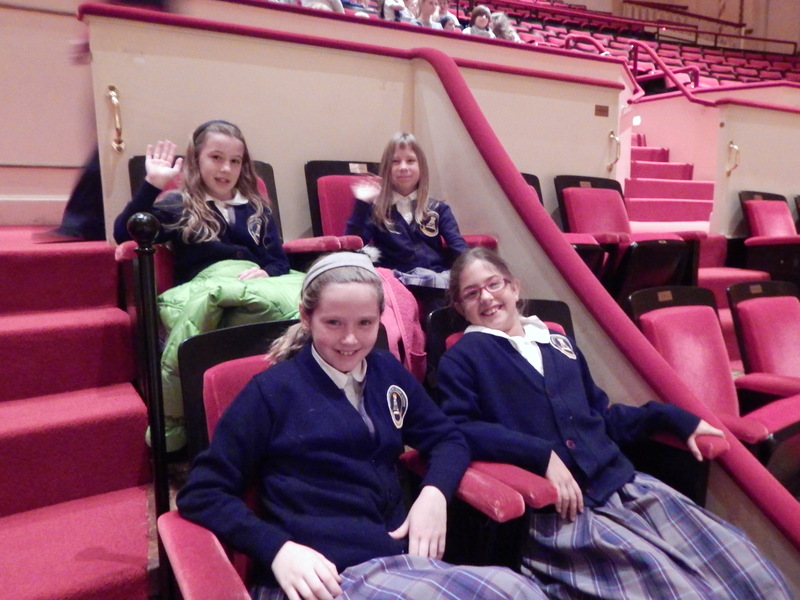 These students enjoyed some good seats. 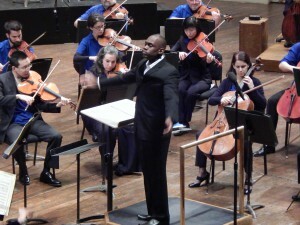 The orchestra was conducted by Joseph Young. Will James got intense with a triangle. 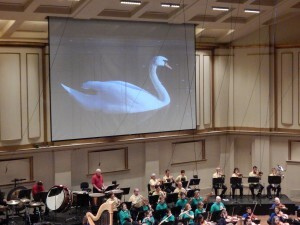 A swan flows along the Moldau. 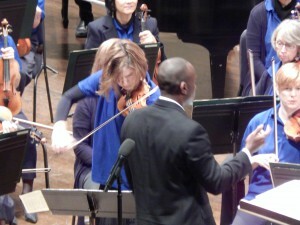 Angie Smart brings on the storm in Vivaldi’s Summer from The Four Seasons. 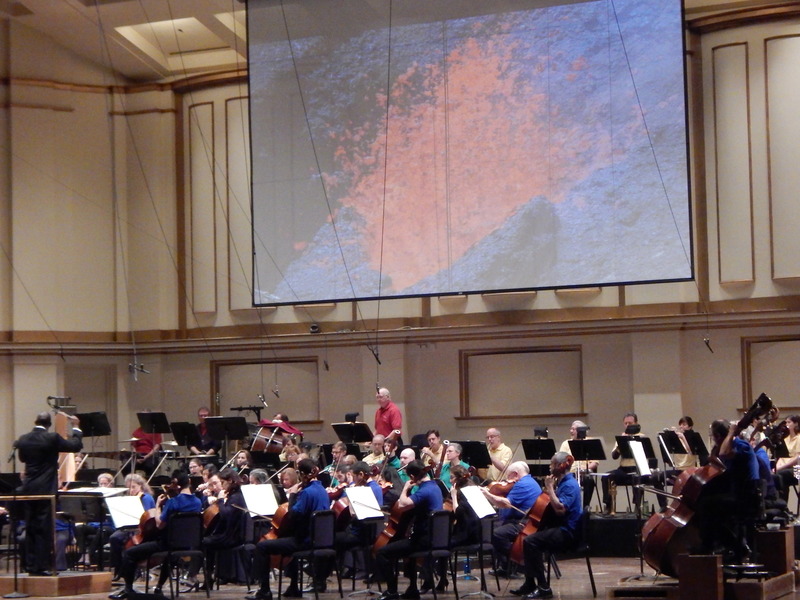 A volcano explodes to the sounds of Falla’s Ritual Fire Dance. 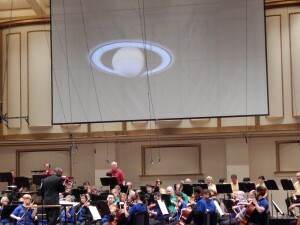 Thanks to the Saint Louis Science Center, John Williams’ Star Wars theme included fantastic images of our solar system, including a flyby of Saturn. 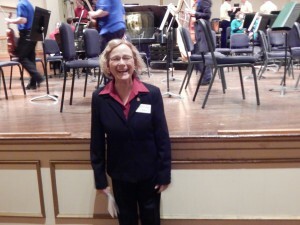 Lovely usher Rita Hoguet comes to the front of the stage to guide schoolchildren, teachers and chaperones to their buses. How was the show? Multiple thumbs up! Joseph Young is in the house! 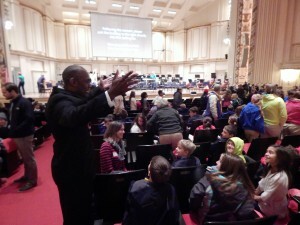 The conductor goes into the audience and gives high fives and says thank you to everybody. 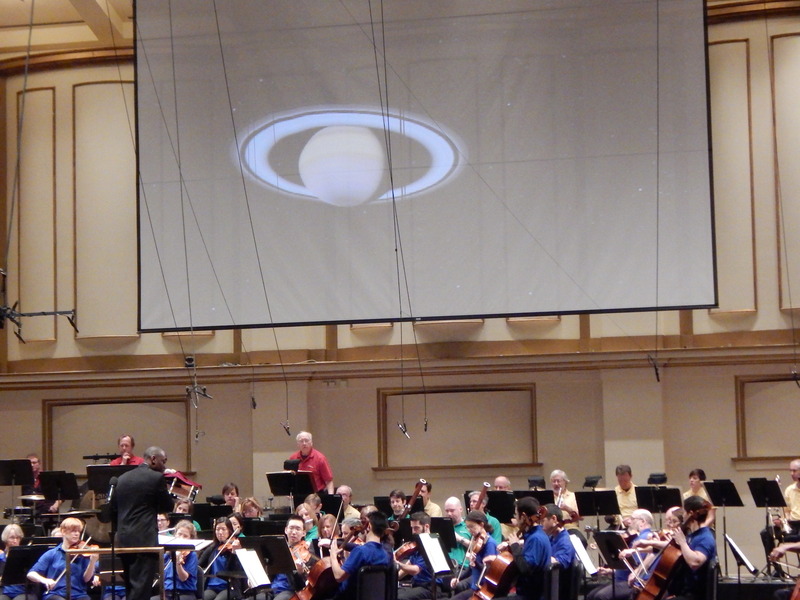 Big kudos to Symphony Director of Education Berakiah Boone for helping to let the forces of nature be for everyone.